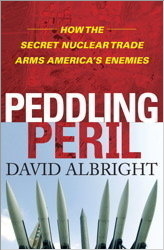 The book by David Albright, Peddling Peril: How the Secret Nuclear Trade Arms America’s Enemies, is available in bookstores in the United States and Canada. The book details how states have proliferated nuclear technology and know-how, and argues that much more can and should be done to stop this pathway to the bomb. Peddling Peril grew out of a multiple year research project at ISIS and draws from a vast array of documents including shipping and procurement manifests, blueprints, satellite imagery, court files and interviews. In support of the book’s release, this section of the website is dedicated to providing interested readers with supplemental materials that will allow further exploration of the themes and stories in the book. This site will continue to be updated as additional information becomes available.